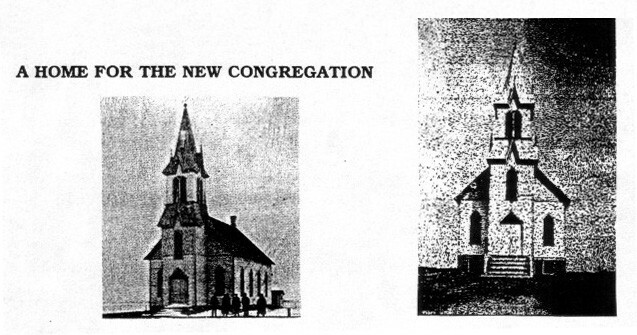 This congregation is situated in the southwest corner of Minnesota, and it still exists. There is no information to suggest that it was people from Holla who gave the church its name. 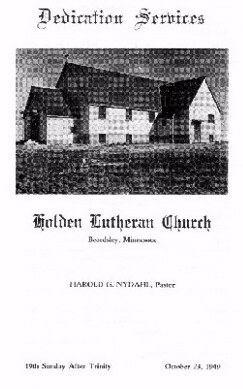 According to O.M.Norlie's book “Norwegian Lutheran Congregations in America 1843-1916” however, one of the officials of the church was one Lars Bøe. This same man is mentioned in Martin Ulvestad's book “Norwegians in America” as Lars Halvorsen Bøe from Lower Telemark. He came to the Beardsley area in 1871 and was there when the congregation was formed in 1885. Seven days later, on February 23, 1885, another meeting was held. 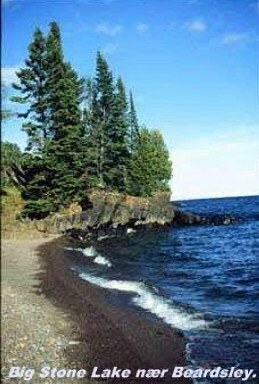 Gunder Knudson donated two acres of open farm land, five and a half miles south of Beardsley, Minnesota, for a cemetery and church site. A call was extended to Rev. E. L. Kjelaas who served as pastor until 1890. 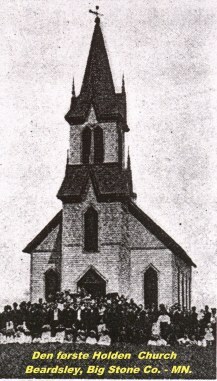 The congregation grew, and In the year 1900 the first of the two church-structures which served as home for Holden Church was built by Lars Johnson of Beardsley, Minnesota on the land donated by Gunder Knudson. The Buildlng Committee consisted of Lars Anderson, Ole Moen, and John Skundberg. The Building Fund was not very large at this time, but $410.00 was subscribed by the men, and the Ladies Aid added the sum of their treasury which was $257.00. 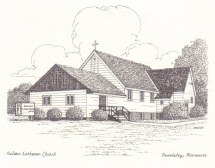 The church building was dedicated on July 8, 1909 with Rev. E. E. Gynild, president of the Lutheran Free Church, officiating. Before the congregation had organized, several people died and these were burled across the road from the Holmlie home. They were later moved to the Holden Cemetery. In 1914 a barn was built on the church property (The barn, probably not much more than a shed or stable, was for keeping the horses In a sheltered spot during worship services and other activities at the church building. When automobiles replaced horses, the barn was no longer needed) and was sold In 1932 to Ed Erickson for the sum of $300.00. 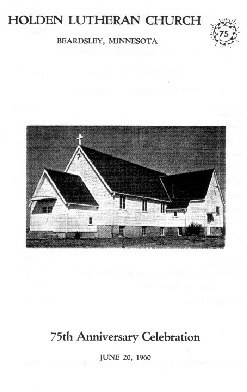 At a meeting held on December 1, 1935, It was decided to build a basement under the church building. Ingvald Kvatum, Anthony Pederson, and Henry Skundberg were appointed as a Building Committee. $950.00 was subscribed to the Building Fund. The basement was completed In the spring of 1936. On June 17, 1944, after devastating the community of Wilmot, South Dakota, a tornado crossed the Minnesota-South Dakota border and angled southeast of Beardsley, Minnesota, completely destroying the Holden Church building. Fortunately no one was hurt, but the building was beyond repair."